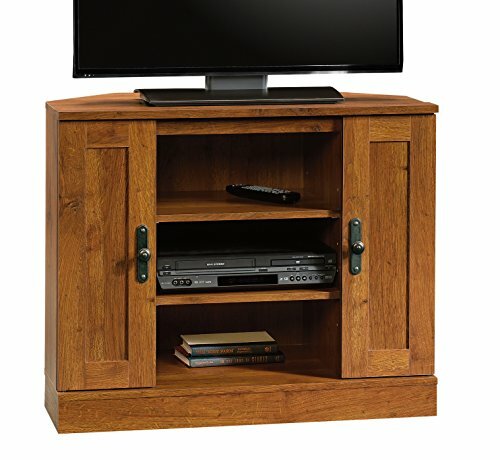 The Harvest Mill Panel TV Stand by Sauder has an Abbey Oak finish. It accommodates up to a 42" TV weighing 95 lbs. or less. Divided shelving provides dedicated storage for audio/video components. It features an adjustable center shelf. Storage area behind doors holds CDs and DVDs. Accommodates up to a 37" TV weighing 95 lbs. or less. Storage area behind the corner entertainment stand doors has an adjustable shelf and holds 68 CDs or 52 DVDs.